Home » Japanese Knotweed » What does Japanese knotweed look like in Spring? That time of year is upon us again; spring has sprung, the daffodils and snowdrops are out in force, and with this, of course, Japanese knotweed has started to emerge from its winter dormancy. Identification of Japanese knotweed in spring can be difficult to the untrained eye but it is easy and straightforward for a seasoned, trained professional. Many plants early in their development at this time of year can often be confused with plants that look similar to Japanese knotweed. 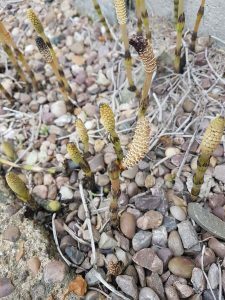 The young, spore-bearing fertile shoots of horsetail (Equisetum arvense), for example, emerge rapidly in spring and can spark alarm. We receive many photographs at this time of year of horestail shoots from people worried they might be Japanese knotweed. 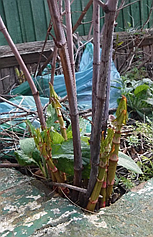 During the early spring, around April to May, Japanese knotweed first surfaces, growing up to 2cms a day as it competes with less vigorous plants to establish a canopy to collect sunlight, forming dense stands of bamboo-like stems in the process. 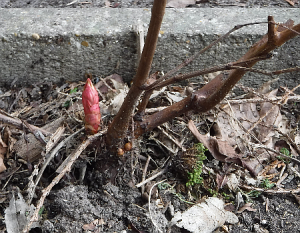 From knotweed crowns (stools of aboveground rhizome mass from where clumps of shoots emerge) the first shoots burst from soft, round, bright pink to red buds, approximately 1-3cm in diameter. These rapidly extend into to asparagus-like spears with pronounced, regular nodes. As the fleshy shoots grow, the new leaves are dark red and 1-4cm long, which gradually unfurl from the central mid-rib of the leaf, which often leave distinctive, pale green, strips on the young leaves in early summer. As the new leaves grow, they gradually being to green, often retaining a pinkish-purple hue on veins and mid-ribs until fully matured. As stems continue to grow upwards the leaves sprout alternately along the bamboo-like canes. By early- to mid-summer the mature Japanese knotweed stems are hollow with purple speckles and can reach up to 3 metres in height. 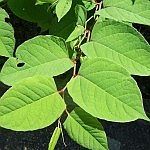 The leaves are green and heart-shaped but flattened at the base (a bit like a shield) and are usually around 12cm long, alternating on each side of the stem producing an obvious knotweed zigzag pattern, particularly near their tips. The flowers that emerge by late summer are creamy-white in colour, and appear in lengthy cluster/spike formations. Japanese knotweed spreads mainly from its underground rhizomes/roots which lie dormant, but alive, over the winter months. Knotweed rhizomes can spread 7 metres outward and 3 metres deep from the visible, aboveground stems. Japanese knotweed can be a serious problem for home and land owners alike. 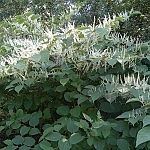 There are no quick-fix herbicide treatments to ensure immediate Japanese knotweed eradication. However, as with many problems, the early identification of Japanese knotweed by a trained professional, and the implementation of a dedicated Japanese knotweed removal service package, with insurance-backed guarantee, will solve most problems, especially where a mortgage or property sale is involved. Phlorum is one of the UK’s leading specialists in Japanese knotweed removal solutions, with offices across the UK, including Brighton, Manchester and Cardiff. We offer our services to both domestic and commercial Japanese knotweed removal clients from anywhere in the UK and Ireland.